Walk in expecting a very CGI-ed movie about magical creatures and you’ll be pleasantly surprised by the warm, cozy nostalgia that slips in with mentions of Hogwarts and nifflers. The secret to enjoying this movie is to not think of it as a Harry Potter movie at all. Just keep your expectations low and distance yourself from (what I consider to be) the impossibly high standards that the rest of the series sets. I loved seeing a familiar and yet new magical world. There is no time for exposition in this blockbuster; we are thrown into the wizarding world with Jacob Kowalski (Dan Fogler), a No-Maj/Muggle/non-wizard that provides an outsider’s perspective. The audience is given little to no context of who the characters are, which I can imagine is disorienting for those who haven’t seen or read the rest of the series. Newt Scamander, an English wizard portrayed by Eddie Redmayne, comes to New York on his way to Arizona. His trusty suitcase works in the same way as Hermione’s handbag in the final book: It’s much larger on the inside. Several ecosystems of magical creatures coexist within it, a feat that is wholly, for lack of a better word, fantastic. 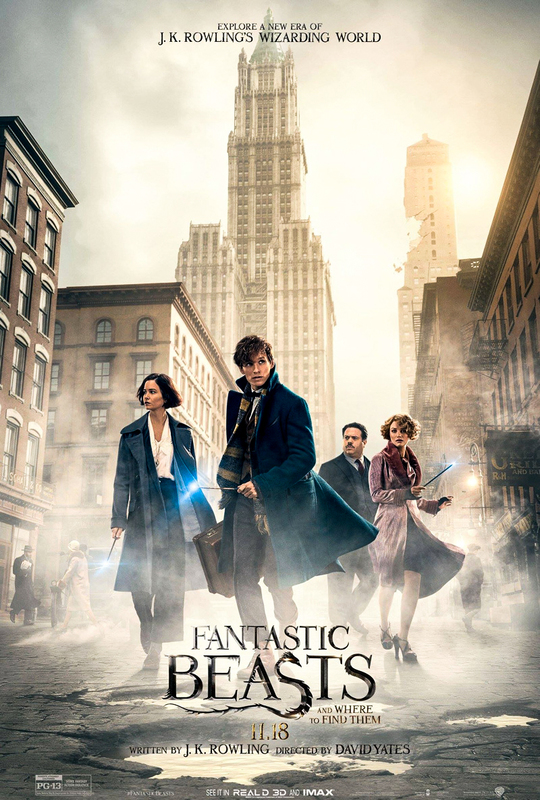 He meets Tina Goldstein (Katherine Waterston), a disgruntled ex-Auror who escorts him into the U.S. version of the Ministry of Magic due to his blatant violation of magical laws. What impressed me most of all about the film was its success in creating a Hufflepuff hero. Going in, I had unconsciously assumed that there would be few references to Newt’s Hufflepuff identity and that, in fact, he would simply be a Gryffindor-type character with a black and yellow bow on top. I was only half right: There were barely any mentions of his House, apart from a gray and yellow scarf that he wears and his aptitude for Herbology, but the many qualities often tied to The Badgers are obvious. Like many protagonists, Scamander’s character has a dash of charm and a bit of idiotic bravery, but a character trait that is most emphasized is his compassion. His creatures are shown time and time again to be his top priority, and his idiotic bravery only slips out when he’s attempting to protect them. “Fantastic Beasts” also addresses complicated family situations. Through the character of Credence Barebone (Ezra Miller), the audience more explicitly sees the consequences of childhood abuse. In the original series, this theme was often glossed over; when Harry spends time with the Dursleys, they are portrayed as unpleasant rather than downright abusive, although they are clearly both. The damage that this kind of violence causes to a child was almost entirely overlooked with only a couple of exceptions, which cannot be said for this film. Credence’s mistreatment is a crucial part of who he is rather than a largely irrelevant portion of his backstory. Although the film’s stance on abuse is clear, many moral conundrums are raised and not all of them are answered. Gellert Grindelwald, the main antagonist, has a plot to expose wizardry to the Muggle/No-Maj world so that wizards no longer have to live in hiding. The violence with which he plans to do this is shown as immoral. However, the film never addresses the possibility of wizards peacefully existing out in the open with the rest of humankind. At one point, Scamander makes an offhand comment about America’s unusually strict laws about interacting with non-wizards, but the topic is rarely addressed again. The potential for a more peaceful world seems to be outright rejected as ridiculous, and the viewer is supposed to take this as fact. One of the biggest takeaways from “Fantastic Beasts” is its physical manifestation of oppression. A new creature is introduced, called an Obscurus, which is created in children that are so hateful of their own magical abilities that they suppress them. Then, by the age of 10 or so, the magic has been transformed into a dark power that eventually consumes and kills the child. Though the film indirectly addresses issues faced by the LGBTQ community and those with mental illness, depictions of diversity are overall extremely limited. Interestingly, instead of the conventional, feel-good encouragement, this film serves as a clear warning about the internal torment that suppressing your identity can cause. Either way, it’s very effective. The drama of scenes that involve the Obscurus are highlighted by the intense, theatrical score. The soundtrack was composed by James Newton Howard and evokes the same tone as the music in the original “Harry Potter” films. These orchestral works are mostly uplifting and bring back a childlike sense of adventure, of fearlessness, of magical opportunity. David Yates’ directing style is also identifiable as reminiscent of the earlier movies, which makes sense, considering that he directed the last four “Harry Potter” movies in the original eight. J.K. Rowling wrote the script for “Fantastic Beasts,” which further lends to the nostalgia that the film induces. Certain bits of dialogue within the film seem to be talking to the project itself, such as when Redmayne very plainly says, “Try very hard not to be predictable.” This movie was undoubtedly made for people who were already fans of the wizarding world. Filmmakers tried their best to make sure that that group was entertained. Wordplay with “Chaser” and “Seeker” (positions in the magical game of Quidditch), along with the frequent use of spells from the original series, gave me goosebumps every time. As always, Redmayne’s stunning acting talents shone through, supported by the classic lovable idiot trope in Fogler’s portrayal of Kowalski and Colin Farrell’s depiction of Percival Graves. Waterston and Allison Sudol, who played sisters, have little character depth beyond the tropes that they represent. Hopefully, both characters will be expanded in future films within the franchise. In 2014, J.K. Rowling announced that there would be a total of five “Fantastic Beasts” movies, so get used to seeing nifflers and Erumpents and billywigs and, of course, Redmayne gracing the screen.